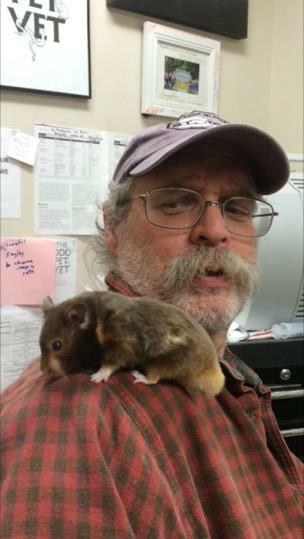 This is a Teddy Bear hamster that came in for a check-up recently to Odd Pet Vet. The ancestors of today’s pet hamsters originated in Asia, mostly in areas around Syria, Russia, and Mongolia. They love to hoard food, keeping it generally both in underground storage chambers and in their own large cheek pouches. A full cheek pouch can as much as triple a hamster’s head in size!